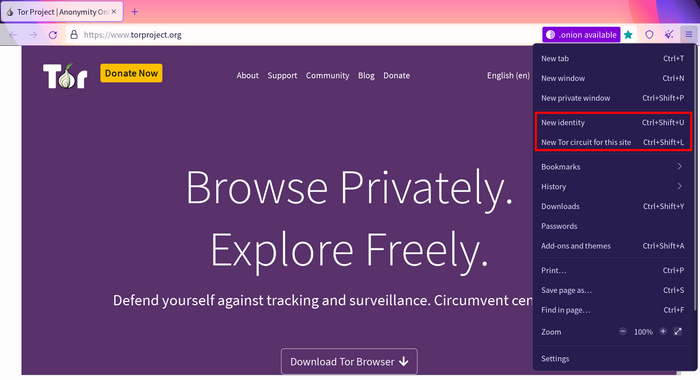 You can see a diagram of the circuit that Tor Browser is using for the current tab in the site information menu, in the URL bar. In the circuit, the Guard or entry node is the first node and it's automatically and randomly selected by Tor. But it is different from the other nodes in the circuit. In order to avoid profiling attacks, the Guard node changes only after 2-3 months, unlike the other nodes, which change with every new domain. For more information about Guards, consult the FAQ and Support Portal. Tor Browser features “New Identity” and “New Tor Circuit for this Site” options, located in the main menu (hamburger menu). This option is useful if the exit relay you are using is unable to connect to the website you require, or is not loading it properly. Selecting it will cause the currently-active tab or window to be reloaded over a new Tor circuit. Other open tabs and windows from the same website will use the new circuit as well once they are reloaded. This option does not clear any private information or unlink your activity, nor does it affect your current connections to other websites. You can also access this option in the new circuit display, in the site information menu, in the URL bar.